The dinner plates were heavy. My 4-month-old son was heavy. The phone call that my husband’s spine may be encased in an inoperable cancerous tumor was unmanageably heavy. We were two months into a two-year ordeal with what turned out to be a rare case of an autoimmune disease called Neurosarcoidosis. The exhaustion was heavy. I was the mother of a 2-year-old and a new baby. I was the wife of a freelance photographer who suddenly and mysteriously lost his ability to stand. I was the manager of our thriving photography studio whose revenue was our sole source of income. Our life was a roller coaster ride of highs and lows, of acts of kindness and worsening symptoms that brought me to tears daily. My life shrank to one day at a time. When my mother asked me who was babysitting the kids on Saturday while I assisted Chris in photographing a wedding, my response was, “Today is Thursday. I will deal with Saturday on Saturday.” I was in survival mode. The here. The now. This single moment was the only moment I could deal with. It was the only moment where everyone in my family was alive and breathing. Any decision I could eliminate I did. I wore jeans and long sleeve T-shirts so I didn’t have to think about coordinating what was on my body. I woke up every morning asking God to show me what to do today. I tried to control anything in this uncontrollable situation. So I cooked. I read up on nutrition. I learned how people were healed with food. I practiced. I failed. I succeeded. I dirtied every dish in the house. I fermented. I sprouted. I juiced. I threw out anything I thought might have caused this or hurt us ,and sugar was the first to go. And then I spent what seemed to be our life savings on restocking with all organic food. I blended. I souped. I smoothied. If there was a way to bring more nutrition into the food and ultimately my husband’s heavy body, I did it. No matter how much time it took or how much money it cost. I changed the kids’ diapers. I did the dishes. I fish-oiled. I obsessed. We drove three hours every couple weeks for my husband’s chemotherapy treatments. It was a cycle I loathed. Treatment. Sickness. Chris finally coming out of it back to himself just in time for another treatment. Following the doctor’s advice, I kept Chris hydrated after each one to flush out the toxin, even though all he wanted to do was sleep and not throw up. I found it ironic that we were supposed to flush out the very chemical we voluntarily put in. I suffered the sadness of no more children because of this treatment. I stared people in the eye, all stoic like, when they told me to be grateful for the two healthy boys we already had. I let them believe it helped. I snapped. Loudly. In the car. This particular day was too heavy to bear. It was early on, and we still didn’t exactly know what we were dealing with. My husband had booked a full summer of weddings, and we didn’t know how we were going to accomplish it. We didn’t know how we were going to pay our household bills, not to mention the medical bills. Our baby was about 6 months old at this point, and he hadn’t had a proper nap since Chris lost his mobility. I was constantly pulling him from his crib to drive Chris where he needed to go — physical therapy, doctor appointments or to and from work. I was tired. One evening, as I put our two sons into the car, I could feel myself losing it. I stopped at a red light, and I screamed at the top of my lungs. I DON’T GET IT, GOD. I DON’T GET IT. IS THIS OUR LIFE? IS THIS WHAT IT’S GOING TO BE? I’M TIRED. I’M SCARED. I’M ANGRY. In the rearview mirror, I could see our 2-year-old’s terrified face staring at this spectacle of a mother I was crying and screaming without breathing. I had no idea what I was even saying. ALL THIS WORK. WE CAN’T EVEN REST. ALL THIS COOKING. I JUST DON’T GET IT. WILL WE NEVER GET TO CELEBRATE AGAIN? WILL I NEVER SHARE A CHOCOLATE CAKE WITH MY FAMILY AGAIN? The light turned green. I stopped screaming, and we continued to the studio. Out front we watched my husband grab the crutches he used to drag his deteriorating body from desk to car. I wiped my tears and managed a “How was your day?” when he was finally settled in the passenger’s seat. We proceed to act normal. At home, I wrestled the kids out of their carseats, leaving Chris to manage his abnormally long commute from car to back door. While waiting on him, I walked through the house to get the mail and sitting on the doormat on our front porch was a chocolate cake. A real homemade chocolate cake with one raspberry on top. The sweetness of hope. A sweetness of “I am here shouldering the weight.” The sweetness of “I have a plan. You celebrate with cake.” That night, we ate dessert first. That cake has shaped the way my life is plated up daily. Sometimes I want to control my situations and know the outcome. Sometimes I want to use my strengths to move ahead. But it doesn’t quite work that way for me. And what I receive from asking is always sweeter than anything I could cook up for myself. Chris overcame his disease. And although there are complications from it, he walks and drives and works and laughs. Chris continues to find enjoyment through his photography studio and applies his appreciation for life in all his shoots. We received a new daughter who has completed the Keels family in the most perfect way. And all that cooking under pressure is being put to good use. My sister and I launched a radio show and blog inspiring kitchen exploration called No Chefs Allowed. There’s no doubt we’re taken care of. But we continue to ask. 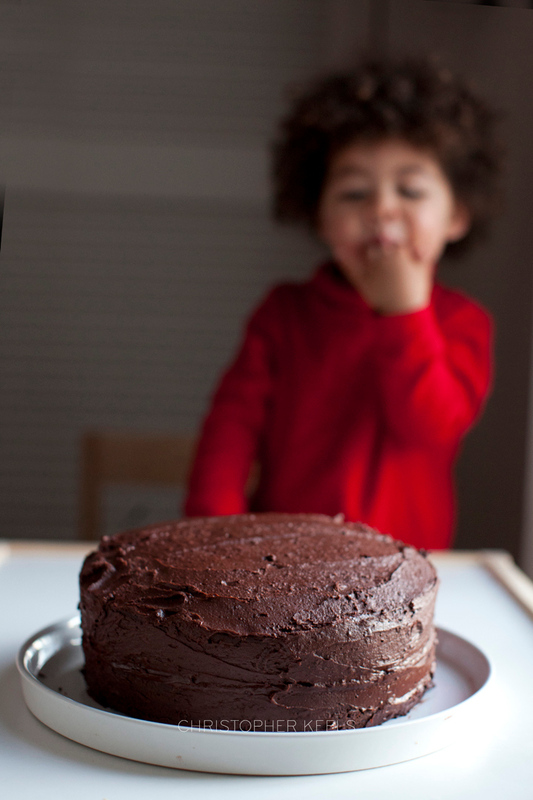 And we are always on the look out for the next chocolate cake. This post originally appeared on No Chefs Allowed. For all of December, The Mighty is celebrating the moments we gave or received a gift that touched our lives in a special way. If you’d like to participate, please send a blog post describing this moment for you. Include a photo and 1-2 sentence bio to [email protected]. Hint! Some gifts don’t come in packages.